The Freedom From Religion Foundation is raising a red flag about a Massachusetts town’s proposed $50,000-plus grant to a church. A concerned local taxpayer contacted FFRF to report that on Thursday, April 4, the Community Preservation Committee in Billerica will hold a hearing regarding a historic preservation grant being considered for First Parish Church in town. The church is seeking half of the $105,755 it will cost to rehabilitate its steeple (apparently not of any special historical significance), according to media reports. FFRF urges the committee to not move forward with the funding project. The committee minutes for its Jan. 24 meeting record that there was “some discussion . . . regarding if the project could be approved due to the religious factor. It was stated that as long as there were no religious icons on or imbedded in the steeple, it could [be] approved.” But this analysis is at odds with a recent decision by the state’s top court invalidating a similar historic preservation award to a church, FFRF contends. 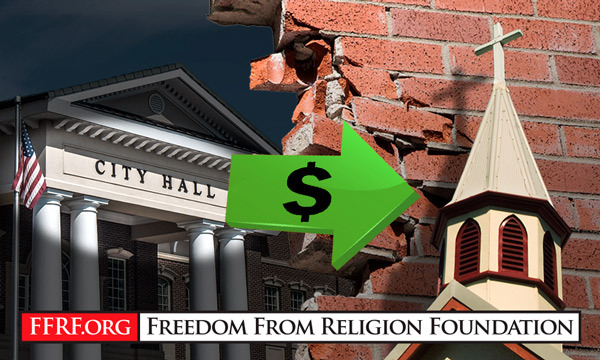 The Billerica Community Preservation Committee’s currently contemplated grant of $52,877 toward the repair of the steeple of an active house of worship is legally indistinguishable on this factor, FFRF emphasizes. Billerica taxpayers — comprised of followers of all faiths and those who have no faith at all — should not be coerced into financially supporting a religion that many of them do not agree with. FFRF strongly urges the Community Preservation Committee to decline this request for historic preservation funding. Just last month, the U.S. Supreme Court let stand a huge win for the Freedom From Religion Foundation in a case involving a similar issue. The N.J. Supreme Court had unanimously held last April that taxpayers in Morris County could not be forced to pay to repair active houses of worship, several of which explicitly sought tax money in order to advance their religious mission. Morris County, defended by the Catholic Becket Fund, had asked the U.S. Supreme Court to take its appeal of FFRF’s resounding victory. The Supreme Court on March 4 denied Morris County’s petition. The Freedom From Religion Foundation is a nationwide nonprofit organization with over 31,000 members, including more than 500 in Massachusetts. FFRF’s purposes are to protect the constitutional principle of separation between state and church, and to educate the public about matters related to nontheism.